The design of I-59 through Laurel pre-dates the Interstate system. It was designed in the early 1950s as part of a bypass of Laurel for US 11 traffic. Construction began in 1955. The passage of the 1956 Highway Act, which created the Interstate system and gave MDOT the financial means to finish the bypass, although it retained its substandard design instead of being redesigned/rebuilt to even the Interstate standards of the day. This early-50s design, including the infamous 40 MPH "S-Curve", as well as narrow shoulders, substandard ramp spacing, and no inside shoulder, has resulted in significant safety issues and a high accident rate along this stretch of I-59. In early 1976, MDOT underwent location studies for a proposed Laurel Bypass for both I-59 and US 84. MDOT's apparent first look into remedies for the S-Curve was in the form of outer bypasses of Laurel for both I-59 and US 84. Four alternatives were created and platted on aerial imagery of the time, encompassing options on all sides of the city of Laurel. Though an I-59 bypass of Laurel was never built, one of the alternatives eventually morphed into today's 4-lane US 84. This map, overlaid on a 2004 aerial satellite image, depicts the area's main highways as they exist today, the routing of old US 84 east of I-59 (now part of MS 184), and the bypass alternative routings. Click on the graphic to view a larger image. 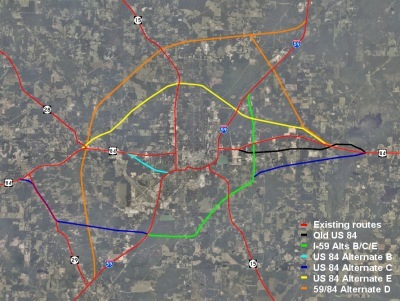 These three alternatives are nearly identical in their routing of I-59, the main difference between the three being in the location of US 84 and the location and configuration of the I-59/US 84 bypass interchanges. For all three alternatives, I-59 bypasses the city to the southeast. The bypass alignment begins approximately 1 mile northeast of the US 11 interchange at Exit 90, going generally due east for about 1.5 miles across a large wetland area associated with Tallahata Creek. The routing then turns northeastward, partially paralleling Glade Paulding Rd to the west. Overpasses would have been built at Luther Hill Rd and at Tom Windham Rd. The alignment crosses MS 15 just north of Woodhaven Dr, with all three alternatives having a diamond interchange at MS 15. Continuing northeast, additional overpasses would be built at Lower Myrick Rd and at Line Rd. Just past Line Rd, the alignment turns northward, passing between Flowers Dr and Jordan Dr. The alignment passes just east of the Eastview Dr/Smith Chapel Rd intersection, with an overpass at Smith Chapel Rd as it begins to curve slightly northwest on its way back to the existing I-59 alignment. As part of this curve, all three alternatives have an underpass at US 11 then a half-directional interchange at existing I-59, with ramps going to and from the south, providing access between Laurel and I-59 towards/from Meridian. Rough depiction of the interchange proposed at existing I-59, the I-59 bypass, and the US 84 bypass to the west as part of Alternative C.
Under Alternative C, US 84 East would have split from I-59 at a point between Line Rd and Manning Dr. This interchange would have been a trumpet, with the SB off-ramp to US 84 East being the loop. Both Alternative C and Alternative E have a diamond interchange at old US 84 (what is now MS 184). Alternative B would have had an underpass here instead. Under Alternative B, I-59 would have a diamond interchange where it crosses today's 4-lane US 84. Alternative E has a diamond interchange located where US 84 would have crossed I-59 in that alternative, roughly at a location just south of the end of Keller Rd. As noted above, the main differences in Alternatives B, C, and E are in regards to where US 84 is routed, and the location and configuration of the new I-59/US 84 interchanges. West of Laurel, Alternative B utilized US 84's existing alignment, then would have had a short bypass section beginning just east of the Flynt Rd intersection and cutting southeast, avoiding the development along W 5th St and 16th Ave. This bypass would have intersected existing I-59 about 1/2 mile west of the 16th Ave interchange (Exit 95AB), with US 84 rebuilt as the "through" route and a trumpet built connecting to existing I-59, with the WB 84 on-ramp being the loop ramp. Through Laurel, US 84 would remain on the existing I-59 alignment, as it still does today. Where US 84 East branches off of I-59 at Exit 97, interchange upgrades were proposed as part of Alternative B. These upgrades would have added a ramp and a loop in the northeast quadrant of the interchange, resulting in a 6-ramp partial-cloverleaf, with a cloverleaf configuration along the northbound side and a folded-diamond configuration along the southbound side. East of I-59, US 84 would have begun along its existing alignment, then starting near Wisteria Trl, it would bypass its old alignment to the north. Near Magnolia Rd, it would cross its old alignment, with a diamond interchange located there, then pass south of its old alignment in the vicinity of Lake Bogue Homa, returning to its old alignment at Masonite Lake Rd. This alternative is what eventually morphed into today's 4-lane US 84. Alternative C would have provided a southern bypass of Laurel for US 84. Beginning well west of the city at Graves Rd, this alternative split from existing US 84 in a southeasterly curve, joining the MS 29 alignment near Oleta Dr. Alternative C then followed the MS 29 alignment southeast, branching off from MS 29 near Violet Rd and going generally eastward from there, paralleling Burnt Bridge Rd to the north, before meeting I-59 at the point where the I-59 bypass would split from existing I-59. The interchange that was proposed at this point and alternative is depicted above. US 84 East would have split off from the I-59 bypass at a point between Line Rd and Manning Dr via a trumpet interchange. US 84 would then have an overpass at Jordan Dr, then travel generally east-northeasterly until meeting the existing US 84 alignment at Masonite Lake Rd. There were no interchanges along US 84 itself under this alternative. Alternative E would have been a north-side bypass of Laurel, with US 84 skirting the northern fringe of the city. This alternative begins near Rose Ln, with US 84 splitting from its existing alignment and continuing northeast. A 5-ramp partial cloverleaf would have been built at MS 28/Existing US 84, with MS 28 rebuilt to tie directly into existing US 84 to the east. A loop would have served traffic from WB Existing 84 to WB "new" 84. The alignment continues in a general northeast direction, passing just south of the Mullican Rd/Service St intersection before crossing MS 15 just south of Bush Dairy Rd. An elongated diamond interchange would have provided access to MS 15 and Audubon Dr. East of Audubon Dr, the alignment turns briefly eastward, passing just north of the MS 537/Meadowlane Dr intersection before turning southeastward. This alternative then would cross US 11 just west of existing I-59, then across existing I-59 just south of US 11. The existing US 11 interchange at Exit 99 would have been rebuilt as an elongated diamond with access to US 11 and the new US 84. The alignment then turns east-southeasterly, crossing Eastview Dr south of Bilbrew Rd, crossing Keahey Gore Rd south of Springdale Rd, crossing over old US 84/MS 184 at Magnolia Rd with a diamond interchange at old US 84, then return to the existing alignment at Masonite Lake Rd. 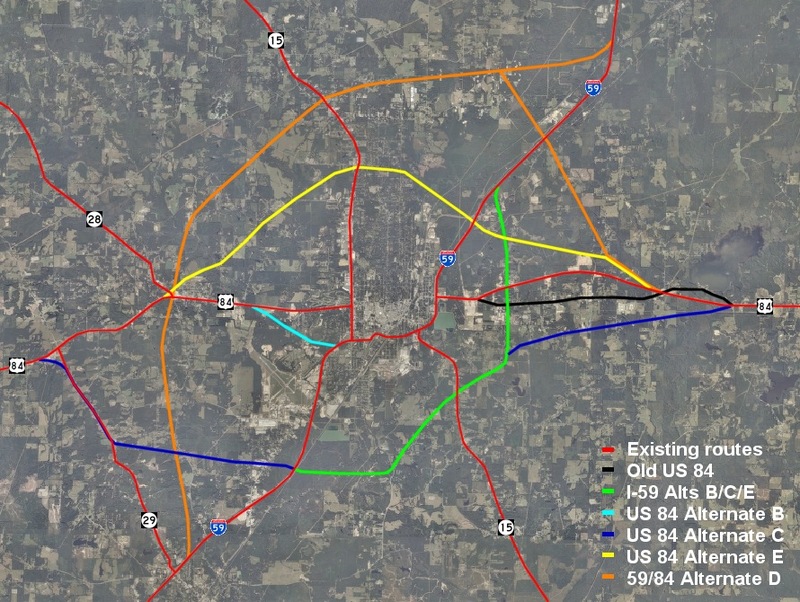 This alternative differs significantly from the other three alternatives, as both I-59 and US 84 would have been rerouted well north and west of the city, making it the longest of the alternatives considered. Alternative D would have begun just north of the MS 29/Ellisville interchange at Exit 88. A trumpet interchange with a SB off-loop would have provided access to existing I-59 here as the bypass begins heading just west of due north. Overpasses would have been built at Buffalo Hill Rd, Flem Phillips Rd (just west of Paulding Rd), Longview Dr, and Indian Springs Church Rd. The bypass would have crossed US 84 at MS 28, with a 5-ramp partial cloverleaf built at US 84 (with an EB 84 to NB "new" 59 loop). MS 28 would have been rerouted west of the interchange. The bypass would then have an ovrpass at Hines Rd just north of Tim Holifield Rd, where the bypass would then turn northeast, with additional overpasses at Service St and Mullican Rd and an underpass at Bush Dairy Rd. A diamond interchange would have been built at MS 15, just north of Water Mill Rd. The bypass then turns more east-northeast, with overpasses at Hoy Rd (just south of Friendship Rd), Lake Como Rd, and MS 537 (just north of Clifton Walker Rd). About 1/2 mile east of MS 537, US 84 would have split off via a trumpet interchange (with the SB off-ramp to US 84 East being the loop). The bypass then cuts across a large wetland area associated with Tallahala Creek before returning to the existing I-59 alignment about 2/3 mile south of the Sandersville interchange at Exit 104, via a half-directional interchange providing access between the bypass and I-59 to/from the north. Where US 84 splits off from the Alternative D bypass, it would travel southeastward, also across Tallahala Creek, with access via a diamond interchange on existing I-59 (existing I-59 as the "through route") and a folded-diamond interchange at US 11. US 84 then would continue southeast, crossing Keahey Gore Rd just west of Brown Dr before turning more east-southeast, crossing over old US 84/now-MS 184 at Magnolia Rd with a diamond interchange there, then returning to the existing alignment at Masonite Lake Rd. All of these alternatives were dated March, 1976, showing that even 30 years ago, MDOT recognized the "S-Curve" on I-59 in Laurel as a problem. Strangely, all of the bypass alternatives would have retained the existing I-59 freeway through Laurel, though it is unclear what the existing freeway would have been renumbered to, or even if the bypass itself would have received a new number. All of the US 84 alternatives would have been an expressway design, though a few select interchanges were also included along US 84. An interchange where the various alternatives would have crossed old US 84 (now MS 184) at Magnolia Rd was shown in 3 of the 4 alternatives. Although the I-59 bypass was never built, Alternative B became the baseline for the US 84 4-lane improvements that were eventually built in the 1990s. Indeed, the 4-lane alignment of US 84 east of I-59 closely matches the alignment that was considered in Alternative B. The bypass segment of Alternative B between I-59 just west of 16th Ave and US 84 at Flynt Rd is still proposed today, though its status is presently unknown. In 1986, MDOT began developing a lower cost solution in the form of a realignment of I-59 in the immediate area of the S-Curve. This project, which runs from the 16th Ave interchange to the 4th Ave interchange, will realign I-59 slightly to the south of the S-Curve, rejoining the existing alignment just west of 4th Ave. The project will include full shoulders, a reconstructed interchange at Beacon St, and auxiliary lanes. The project is now under construction, with a projected completion of August, 2009.